If there’s anything good about going for walks or getting around in general, it’s that you can come across a bunch of cool stuff. “Dumpster diving” as it were. When I rode my bike to that last shithole of a job I had, I came across my share of street reflectors that had come loose and were strewn here and there. Sure, I picked them up and gave them to Anthony and he now has a decent collection of them. That’s cool stuff for a kid. While walking a few weeks ago I came across three 5-gallon buckets of paint. No big deal, right? It was for us—we are planning to remodel the bathroom and this would save us quite a bit of money. So I finished up my walk, drove over to the buckets and hauled them home. 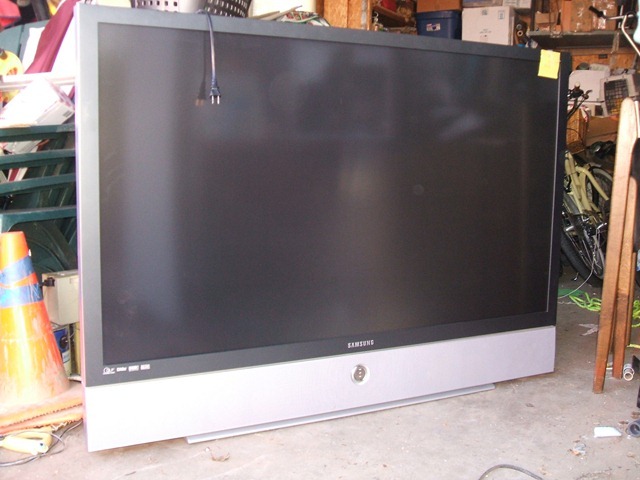 And just a few days ago while taking Anthony to school, I came across what I thought was the mother lode: someone was throwing out a 61” Samsung rear-projection TV. It didn’t matter. I packed it up and hauled it home and immediately starting researching the cost of a bulb. If it worked, this would be perfect because our old Sony WEGA TV in the living room is about to die anyhow. When I got it home, I plugged it in to see if the thing showed any signs of life. It did, but there was no picture to be seen. Bummer. I then called a few places about the replacement bulb. One told me they didn’t carry them and to check online. Another quoted me a price of $285 (as I laughed hysterically). My only other option was to check eBay and hope for the best. And of course, eBay came through. I found one for $95 with shipping and tax so I went ahead and ordered it, so all we needed to do was wait for the bulb to show up at our door. And today was the day. We were about as excited as The Old Man was when his leg lamp arrived. Come on, essentially, we were getting a 61” TV for only $95. You’d be pretty jazzed about it too, wouldn’t you? Per the instructions, I put on a pair of rubber gloves to avoid getting skin oils on the potentially hot bulb, removed the old one, replaced it with the new one, put it back into the TV and fired it up. Nope, one one damn thing. About the only thing I got out of it was sound from the coax cable running from the FiOS box. But other than that, hopes of getting a TV on the cheap were never to be, and the cost of repairing it from this point on may be just a bit out of my range. So, much in the way I found it in the first place, I plopped the TV out in the parkway so some other sucker…I mean, someone else can take it home and try and work on it. I even left the note on it. And within 30 minutes, there was a knock on the door. Some dude was asking if he could take it and I told him it was all his, and that I tried a new bulb but to no avail. He said thanks and he and a buddy loaded it in the back of their truck. For whatever their reasons, five minutes later they returned and left the TV right where they found it. No kidding—it’s sitting out there taunting me as I type, like Franklin and that damn slot machine. I will be sending the bulb back tomorrow to get my money back, minus shipping and restocking fee, of course. And the next time I see some random crap sitting around while on my walk or whatever, remind me to run in the opposite direction and never look back. This entry was posted in Daily Walk, Entertainment, Life, Television by Dave. Bookmark the permalink. Good post! Sorry that you didn’t succeed with the repair. Yeah, I tried. It would just run into more money if I decided to keep it. And you’re probably right–this TV has probably made the rounds in the neighborhood!